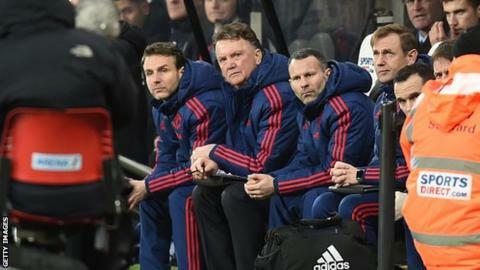 Manchester United boss Louis van Gaal "cannot imagine" it will take the club 26 years to become champions again. United went that long before winning the league under Sir Alex Ferguson in 1993, a barren run Liverpool will equal if they fail to finish top this season. "I cannot imagine that shall happen," said Van Gaal. "We are in transition but we have the infrastructure and are going the right way." Liverpool and United meet in the Premier League at Anfield on Sunday. Van Gaal has won all three competitive meetings with Liverpool, including a victory at Anfield last season, since becoming United manager in 2014. But a run of one win in eight Premier League games sees United in sixth spot, three places and three points above Sunday's hosts. If they fail to win at Anfield it will be United's worst run since 1989-90. "You could still say we have underperformed because Manchester United has to be in the first three in the Premier League," said Van Gaal. "The same thing counts for Liverpool." The Dutchman also said he was backing captain Wayne Rooney to improve an indifferent record at Liverpool. Having scored only once in 10 weeks from 17 October, Rooney has netted four goals in his past three games, including two in the 3-3 draw at Newcastle on 12 January. But not since March 2012 has he scored in four consecutive club games and the 30-year-old does has generally struggled at Anfield, managing one goal in his 10 visits. "Wayne has to break that record," said Van Gaal. "Then I am very pleased. "When he scores, it makes it easy for me. I have put all my money on Wayne."